Stud & Hook Earring Holder - Turquoise Rick-Rack Design Ribbon, 5x7 Jewelry Display - Keep Earring Backs ON! Stud & Hook Earring Holder - Turquoise Rick-Rack Design Ribbon, 5x7 Jewelry Display - Keep Earring Backs ON! by Never Lost Earrings at Nicky's Blog. Hurry! Limited time offer. Offer valid only while supplies last. 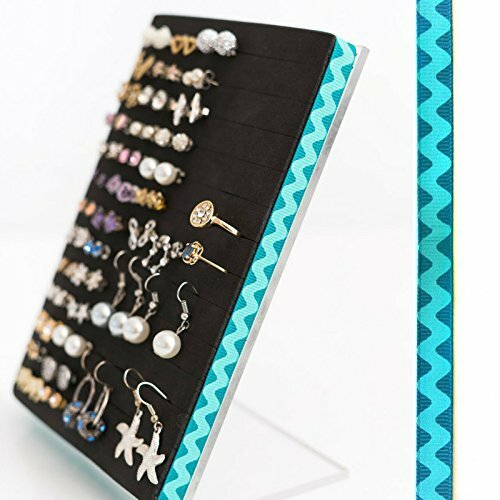 This Earring & Ring Holder is the perfect solution to keep your Jewelry Organized and Never Lost! The best part is you KEEP THE EARRING BACKS ON! This Earring & Ring Holder is the perfect solution to keep your Jewelry Organized and Never Lost! The best part is you KEEP THE EARRING BACKS ON! This system works perfect for POST & STUD earrings, HOOK & HOOP earrings & thin band Rings. AND.. will work with Helix Rings, Septum Rings, Nose Rings and other body jewelry. The acrylic stand is 5x7 in size and is trimmed with a decorative Turquoise Rick-Rack Design Ribbon . The front foam has 13 pre-cut lines that can hold at least 4-5 pairs of earrings each line. That is a total of approximately 52 pairs of small earrings, however this can be less depending on the size of your earrings and rings. Please see pictures. The front is made of a stiff black foam which holds your jewelry FIRMLY in place! And the best part is you LEAVE THE EARRINGS BACKS ON! It can be used over and over again and will not tear or fall apart. I offer this in a WHITE foam front. Please message me for request. * This will solve all of your organization problems when it comes to your earrings and rings. * You won't have to search in drawers or little containers for every pair. * They will be displayed and organized right in front of your eyes. LET ME CUSTOMIZE AND CREATE ! If you have an existing jewelry box, I can custom make the foam insert to fit. Please email measurements of box and I will quote you a price. I charge .20 per square inch, plus shipping. I'm always creating new and exciting products to help you organize your jewelry. Please follow me on my Social Media Networks for upcoming promotions, jewelry organization ideas & updates. I guarantee you will LOVE this product. It will simplify and organize your life. Your Jewelry Life!! If you have any questions about this product by Never Lost Earrings, contact us by completing and submitting the form below. If you are looking for a specif part number, please include it with your message.